You will obtain 432 mg equivalent to 432,000 mcg of OPC per Euro (which is 240,000 mcg per capsule). Please compare this value. Our OPC does not include monomers. There are vendors claiming to supply "the world's highest purity per capsule: such as 60.000 mcg". But this actually means only 60 mg per capsule. "Nativ-OPC premium by Dr. med. Michalzik" is a certified OPC product. Our proven high content of pure OPC in the grape seed extract guarantees the customer that the name OPC truly stands for OPC. OPC Premium by Dr. med. Michalzik is made from French grapes. You will obtain 432 mg OPC per Euro. Please compare this extraordinary value. Our OPC does not include monomers. Nativ-OPC Premium by Dr. med. Michalzik is a certified OPC product. Our proven high content of pure OPC in the grape seed extract guarantees the customer that the name OPC truly stands for OPC. "OPC 95 - the strongest antioxidant in the world, most likeley the best OPC in the world""unbeatable value for your money". Now, let’s look at this in more detail: Other providers label their product as OPC 95. This term is also used by raw material suppliers who promise 95% OPC, but when questioned about the tested OPC content, it is found they usually tested the polyphenols. It should be clarified that these are two very different claims! Likewise, e.g "105 mg of OPC per capsule"is declared. At 95 % OPC, this would amount to 110.5 mg grape seed extract per capsule. The OPC content has not been verified with an analysis certificate. A provider from Switzerland labeled his product as 300 mg of OPC, but after analysis of the product only 5 mg were found. It is not know where the grapes came from. Often grape seeds that have been cultivated in China are used, leading to extremely low prices. 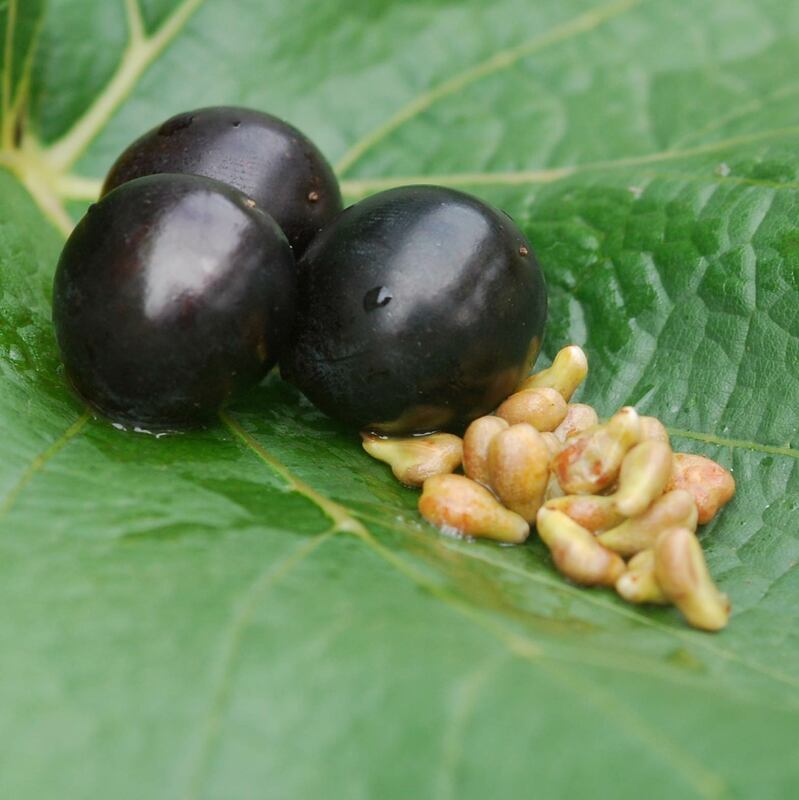 In comparison, Biotikon offers 450 mg grape seed extract per capsule, increasing the quantity by four times. The OPC content (240 mg) is based on an analysis. The analysis is published. The grape seeds come from France which provides the highest quality of grapes. Conclusion: By taking a closer look at the cheaper product, you may find that it might not have a better price performance ratio (performance to cost ratio). OPC 300 mg: the advertising made by competitors promises 300 mg of grape seed extract content, meaning that the OPC content would have to be 100 %. Here the grape seed extract and OPC content are claimed to be equivalent. The term OPC 95 %: OPC 95 is used by many manufacturers to describe their OPC quality, but actually it usually indicates a lower OPC quality. Often this does not refer to the OPC content, but to the analysis value according to "Bate Smith", stating the ratio value which is not applicable to measure the exact amount of OPC. Otherwise he refers to the polyphenol content. The term OPC 95 % does not mean that 95 % of OPC is contained. When buying OPC, ask for the original certificate of analysis (CoA) from an independent German Analysis Institute which identifies the OPC content. OPC Premium by Dr. Michalzik is subject to strict examinations of German supervisory authorities. It is manufactured by use of gentle production technologies without heat or additives and without the use of processing agents which are not required to be mentioned on the packaging. OPC 400 mg, 450 mg, 500 mg: Again, you should make sure that these statements do not refer to the capsule weight, but to the actual OPC content. OPC is a worldwide recognised substance, but few mastere the difficult subject of OPC analysis. The OPC analysis certificate should always identify the OPC. It is important that the OPC content is measured directly by analysis in the grape seed extract. We also recommend to confirm the OPC content through a German certificate of analysis from a German laboratory. It is also important that the residence of the OPC provider is in Germany, as in other countries sometimes verifications are not required. For questions, please directly call Dr. Alexander Michalzik and Team: +49 (0)6201-878380. We are happy to assist you. ORAC units of the current batch over 14000 mikromolTE per capsule (hydrophilic and lipophilic). Oxygen radical absorbance capacity (ORAC) is a safe measuring method of measuring ORAC scores, or the antioxidant capacities in biological samples in vitro. It shows the ability of a substance to absorb free radicals. Currently no scientifically known evidence exists about the ORAC value's impact on physiological processes in the human body and its health. However, the ORAC value is an important characteristic of the used grape seed extract and the raw material for the capsule preparation. 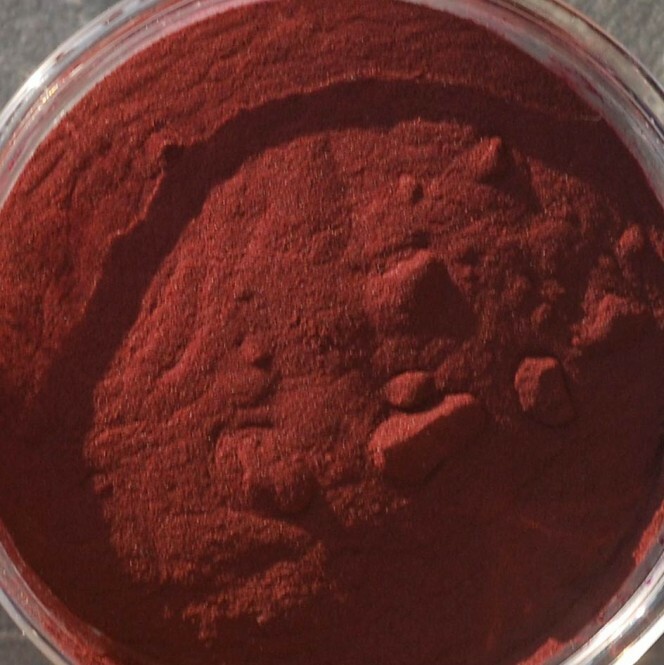 If the grape seed extracts are exposed to air or higher temperatures for a longer period of time then the ORAC value is lower because the OPC can already partially oxidise. No magnesium stearate, this metal soap originates from the construction industry and is used by many manufacturers. Certified goods with German OPC analysis certificate for your safety. RP-HPLC OPC analysis method for reliable OPC ingredient specifications. The RP-HPLC method, reverse phase high performance liquid chromatography is a very valid OPC analysis method.  OPC is the abbreviation for oligomeric procyanidins. OPC Premium by Dr. Michalzik, does not add monomeric procyandins into the analysis result. Test specifications are available at www.opc grape seed extract.de Nativ-OPC Premium tested with RP-HPLC method. 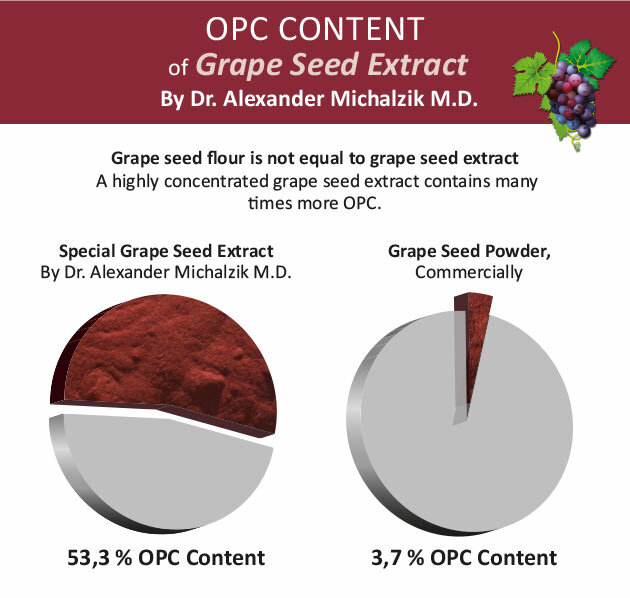 The grape seed extract is not the same as OPC and should not be specified as such. The manufacturer should differentia this fact. Procyanidins may be present in the monomeric form, but these are not OPCs. The OPC specifications should be authenticated with a German Certificate of Analysis. Product has been processed in Germany. The grape seeds should originate in Western Europe if possible. Our grape seeds come from France. Capsule filling should not contain additives. Short delivery time, thus preserving the quality of product. OPC capsule material from vegetable-based raw material (cellulose). The use of appropriate analytical methods. OPCs are proanthocyanidins without the monomeric proanthocyanidins. Measured with RP-HPLC-method, test specification PV.03.P194_2. View test specification under www.opc-grape seed extract.de. Validation by mass spectrometry (MS) and diode-array detection (DAD). ** Corresponds to 62 % of the National Reference Value (NRV) for a daily intake in accordance with the Food Information Regulation (LMIV). 450 mg of grape seed extract contains 240 mg of OPC measured directly in the extract for better precision. (Test specification PV.03.P194_2. OPCs are proanthocyanidins without the monomeric proanthocyanidins. Validation by MS and DAD (see above). Unlike many other OPC products, only 1 capsule per day is sufficient due to the exceptionally high OPC content of our product. OPC content measured in the grape seed extract, 240 mg (test specification RP-HPLC PV.03.P194_2, view under www. Opc-grape seed extract.de. )OPCs are proanthocyanidins without monomeric PAC proanthocyanidins). Validation by MS and DAD. Additional polyphenols 140 mg, such as catechins, epicatechin, quercetin, etc. Grape seed extract may contain many substances. First of all, the polyphenols (phytochemicals) are important. Simple grape seed flour, which is not an extract, thus is not comparable and partially contains only 2 - 3 % polyphenols. OPC extracts are up to 40-fold concentrated. A subgroup of the polyphenols are proanthocyanidins (procyanidins, PAC). 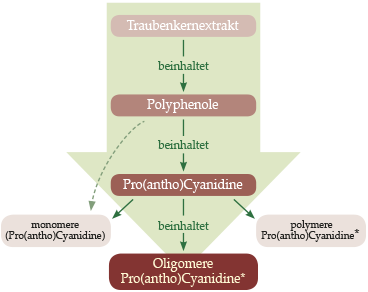 These contain oligomeric procyanidins (proanthocyanidins) and monomeric procyanidins Unfortunately science does not clearly define the demarcation of oligomeric and polymeric proanthocyanidins. 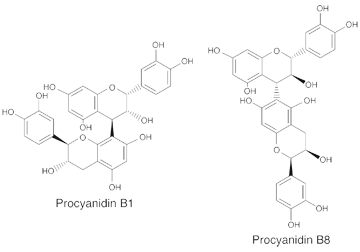 The"polymeric proanthocyanidins" shown in the diagram describe macroscopic molecular structures. 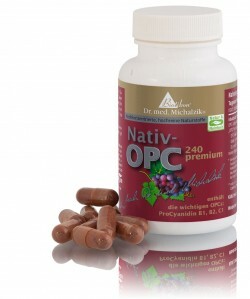 72 Nativ-OPC 240 premium-capsules, each capsule contains 450 mg grape seed extract. Additional Information: All our OPC products contain high-quality grape seed extracts. The essential difference lies in the OPC content of a product. The higher the OPC content, the costlier is the production. OPC is a so-called radical scavenger. "Free radicals " which are also called "reactive oxygen species" can trigger oxidations inside the cell.